Linux can be equiped with CacheFS which is developed by David Howells. CacheFS is designed to operate on Network File System mounts and you will need to install the cachefilesd package which contains the CacheFiles userspace management daemon. 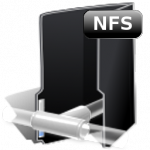 The cachefilesd daemon manages the cached files and directories that are used by network filesystems such as NFS to perform persistent caching to a local disk.